We love all the Super Bird Toys that are built on the refillable 7" stainless steel fun ring because the possibilities are just endless! 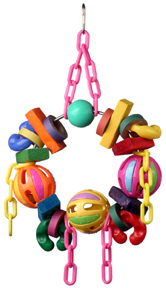 The Circus Act has #6 plastic chain with a nickel plated quick link on top for easy hanging. There are 3 plastic balls with a bead inside that makes a really cool sound, there are several blocks of colorful, chewy softwood, a large plastic ball, several chunky bagels, a few parrot donuts and lots of beak pleasing fun with this refillable toy designed for the bigger beaks in your life. You can even use this stainless steel ring for food ... just be sure to change it daily and thoroughly wash the ring!